This weeks photo challenge theme is: Two Subjects. After last week, this one was easy. I knew before I was even done reading the email exactly what image was going to use. Then I started looking through my Lightroom catalog and found several more that I thought fit. The Bridge and The Mountain. It’s not always about the waterfall. In this next one, having photographed Tucker Brook Falls many times, the sunlit rock in the foreground is what attracted me to this composition. To me it holds equal footing with the waterfall as the subject of the photo, and not just the prerequisite foreground element. The last one for this week is a shot from two years ago. 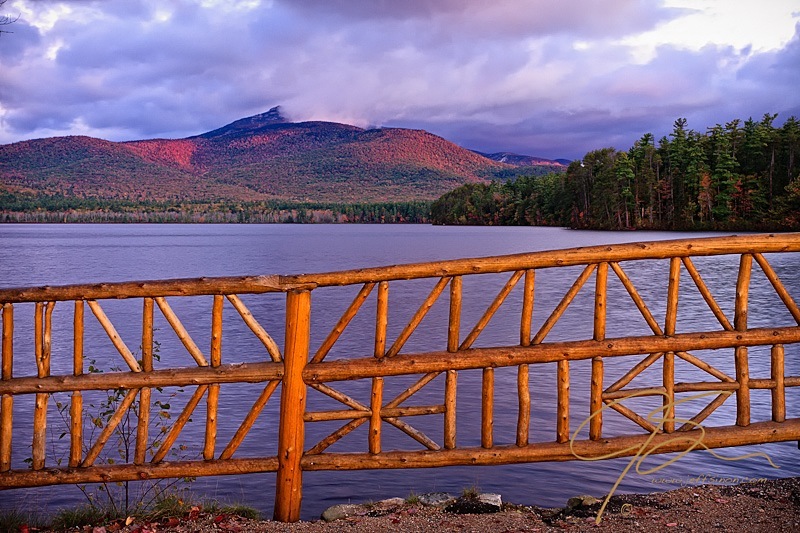 Taken along the Kancamagus Highway in the White Mountain National Forest in New Hampshire. 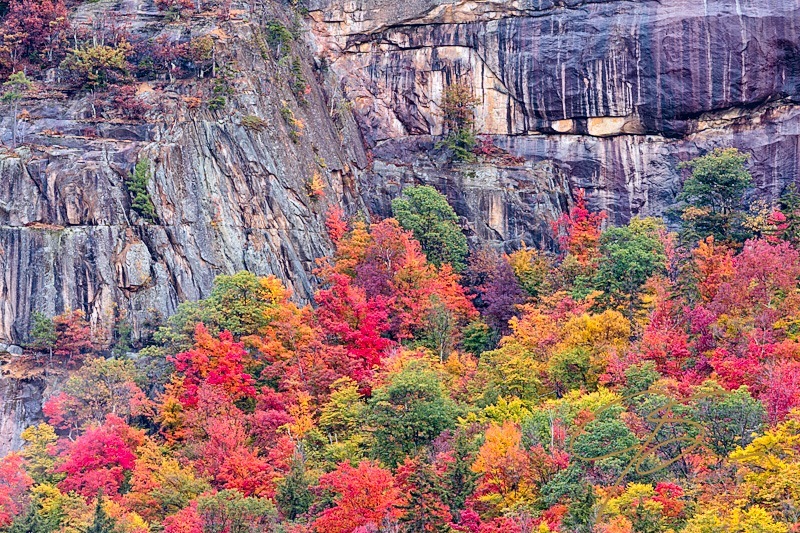 The brilliant warm colors of the fall foliage compete with the cool hard granite ledge to be the center of attention. I consider it a draw. Until next time, if you would like to see more of Jeff Sinon Photography, click here, or the banner to the right, and become a fan on Facebook to keep up with all of my newest images and travels with my camera. All three are good, can’t pick a favorite! Thank you Briten, I’m glad you like them. Hot and cold is my favourite! It is one of mine as well. There is nothing like autumn in New England! Ohhh … they’re marvellous — love all of them! The last one is YUMMY! Colours explosion! Jeff, you are a truly amazing photographer! I, too, cannot pick a favourite. My goal this summer is to figure out how to make my waterfall shots look like that!!! I’ll let you in on a little secret, it is so easy you won’t believe it. One thing you absolutely need is a tripod, because to get the water looking like that you need a long exposure. I shoot, no pun intended, for a 1/2 second, to as long as a 5 second exposure. A remote release is nice to have, but the camera’s self timer works too. The hardest part is lighting. An overcast day is ideal, so you have nice even light. If part of the falls is in bright sun you are either going to end up with really dark shadows or blown out highlights on the water. You can also go very early in the morning or late in the evening when the sun is low, and hopefully the falls of you choice is in full shade. Once the leaves on the trees are in fully and everything is nice and greened up, the tree canopy helps. I usually opt for the early morning though because I hate people in my photos, and most of the really nice falls here in NH are tourist magnets! I’m sure I’m leaving something out, but those are the basics. I always feel strange offering, because I don’t want to come across as a full of myself know-it-all, but if you ever have questions, don’t hesitate to ask. Whether a general photography, or image specific, if I can answer it, I would be glad to. You can contact me through the “contact” on the blog, message me on FB, or just ask via reply to one of my blog posts. Looking forward to some of your waterfalls! Good luck, and lets see some pics! Ok if I add something? As Jeff noted, cloudy days work best. 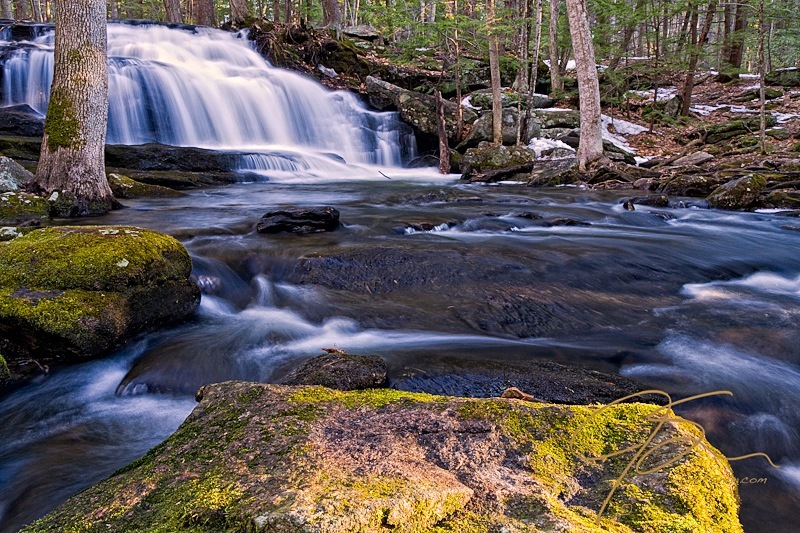 Another great tool is the use of Neutral Density filters. In short, you add them (You can combine them depending on the light situation.) to your camera lens and they darken the scene. This results in the ability to use a much slower shutter speed with creates the motion blur. You are more than welcome to add Rick. I can’t believe I forgot ND’s, and I almost always use a circular polarizer too. And if you are swimming in $$$ the Singh-Ray Vari N-Duo is a variable ND and CPL all in one. All you need to do is be willing to cough up the $400 for it. Thanks Jo. I learned early on that to get good sharp landscape photos a tripod is a must, not an optional accessory. Thank you Madman, your entry for this week is quite spectacular. I would love to visit and photograph mountains like that one day! Hi Jeff, Thank you for visiting my blog. Hope you come again. I enjoy your photos, they are amazing. You are quite welcome, and I assure you I’ll be back! I’m always caught by your showing of bold colour in simple but detailed settings. Nice shots for this challenge. As for that “glow,” mother nature did most of the work. Though I did help to bring it out little in Lightroom. As I set up the shot, the sun was rising behind me and to the right. The railing is on a bridge separating the large lake in the foreground from a smaller lake behind me, giving the sun a pretty clear shot to shine on the railing. For planning these kinds of shots I use The Photographers Ephemeris. You can download the free desktop version here: http://photoephemeris.com/. There is also a smart phone app as well, but that is $10 U.S. TPE is becoming more and more a part of my planning when it comes to landscapes. Knowing the direction the sun will be hitting something as it rises or sets, as well as the time of year the angle will be just right for a photo I have in mind, is indispensable. You are quite welcome. TPE is a great app for planning landscape shoots. I use it all the time. Like I mentioned, there is an iPhone version and an Android version too, but they aren’t free. But they are worth the price in my opinion. All very nice – I like the vibrancy of the colors. Great photos. I think my favourite is the autumn colour contrasting with the rock. Stunning. Thanks for including all these tips in your comment conversation. So very helpful. And thanks for visiting my blog too and taking the time to comment. Thank you Kate. I may not know everything there is to know about photography, but what I do know I’m more than willing to share. Excellent once again, Jeff. And I really like your point about two different subjects in the 2nd image rather than the rock as mere formality to help support the waterfall element. That photograph really exemplifies the importance. Good stuff, as always. Thank you Arindam, thank you very much! Thank you for the gracious compliments Amber. And thank you for taking the time to pay a visit to my blog. Wish you all the best, Cassie. Re-blog away Cassie, I’m honored! Yeahy, thank you, Jeff! I’ll do that! Wish you the best, Cassie. You are so very welcome Cassie, and best wishes right back at you! Thanks for continuing to share your photography with the rest of the blogging community, Jeff!